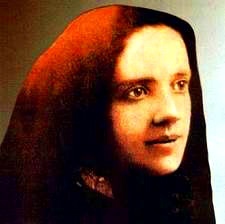 Born in 1850 at Sant'Angelo di Lodi in Lombardy, Mary Frances Cabrini was the youngest in a peasant family of 13 children. Even as a child she was known for her piety and love of prayer; and she dreamed of being a missionary in China. At 18 Saint Francis Xavier Cabrini received her teacher's certificate; and when her parents died the following year, she sought admission in two different sisterhoods but was rejected because of her poor health. During the next 10 years she devoted herself to teaching and directing a school for orphans, and satisfied her zeal by giving catechism instructions and visiting the poor during free time. During a smallpox epidemic in 1872 she did heroic work as a nurse. But Mary Frances still wanted to be a missionary; and in 1880, with the encouragement of the bishop of Lodi, she and a few companions took up their residence in a former Franciscan Friary and thus founded a new religious community, namely the Missionary Sisters of the Sacred Heart. Previously Mother Frances Xavier, as Mary Frances was now called, had been an exemplary Tertiary of St Francis of Assisi. In the decree of the Sacred Congregation of Rites on the heroic quality of her virtues we find the following statement: "She imitated to a high degree the virtue of three saints who bear the name of Francis, and modeled her life according to their example. Thus she imitated the virtues and example of St Francis of Assisi, whose Third Order rule she professed and fully observed." And even after founding a new sisterhood, Mother Cabrini continued to derive inspiration from the example of the Poverello for her mission of apostolic charity. In 1888 Mother Cabrini's institute received the approval of the Holy See; and the next year Pope Leo XIII directed her to go, not to China, but to the United States, and to make the Italian emigrants in that country the object of her charitable and apostolic work. With six companions, Mother Cabrini arrived in the United States on March 31, 1889; and, though she also visited Central and South America, she spent the greater part of her remaining life in the United States. She became a United States citizen in Seattle in 1909. At first Saint Frances Xavier Cabrini encountered many difficulties, but soon she accomplished the apparently impossible. Amidst feverish activity, she always maintained great tranquility of soul and prayerful union with God, entrusting all her undertakings to God with unbounded trust in Divine Providence. When the cause of her beatification was commenced in 1928, her sisters, 2,000 in number, were caring for 67 institutions in 8 countries of America and Europe. Mother Cabrini suffered from fevers for months at a time, but she kept up her amazing activities for God and for souls until she died at Columbus Hospital in Chicago on December 22, 1917, at the age of 67. Saint Frances Xavier Cabrini was beatified in 1938, and canonized in 1946, the first United States citizen to be thus raised to the full honors of the altar. 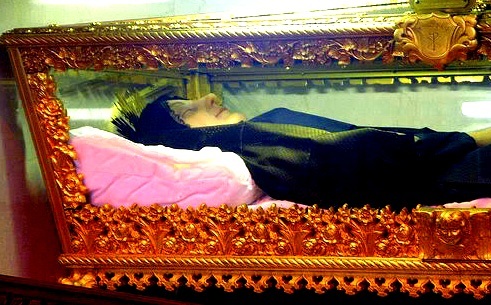 Saint Frances Xavier Cabrini "Mother of the Emigrant's" body rests beneath the high altar in the chapel of Mother Cabrini High School, in the northernmost part of Manhattan, New York City.